The NXPTZHD is an exceptional PTZ camera perfect for heavy-duty tasks and ideal to operate in the harshest and most corrosive environments, such as industrial and offshore/onshore marine applications. This PTZ camera ensures long-term performance, with low maintenance and is made entirely out of AISI316L stainless steel. Its resistance to corrosion is not only guaranteed, but is also enhanced by way of polishing processes. 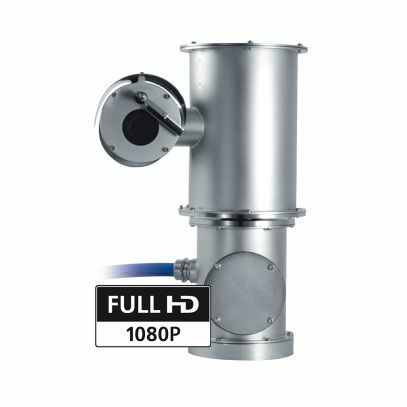 The Full HD Day/Night camera, available in 30x zoom, 1080p, accurately identifies the details of a scene delivering from 2 to 4 H.264/AVC or MJPEG video streams simultaneously, up to a total of 20Mbits, depending on system configuration. The flexible operator control of Pan/Tilt/Zoom functions allows the images transmission over Ethernet with H.264/AVC and MJPEG compression, certified ONVIF, Profile S. The Videotec's PTZ ASSISTANT plug-in software supports any VMS with the control of all special functions such as wiper and washer pump. An equally noteworthy point is that the IP66/IP67/IP68 ratings guarantee the complete protection against harsh weather and immersion in up to 1 metre of water for 2 hours. Moreover the IP69 rating allows the device to be cleaned with high pressure and high temperature water jets. The NXPTZHD is always supplied with integrated wiper; wide choice of tanks with washer pump available with different capacities and delivery heights. The NXPTZ series products are Lloyd's Register Type Approval System Test Specification Number 1 certified and therefore can be used in Marine and Offshore applications for environmental categories ENV1, ENV2, ENV3 and ENV5 (eg. passenger ships, open-air decks, closed spaces and technical areas that may be subject to heat generated by other equipment, docking procedures).